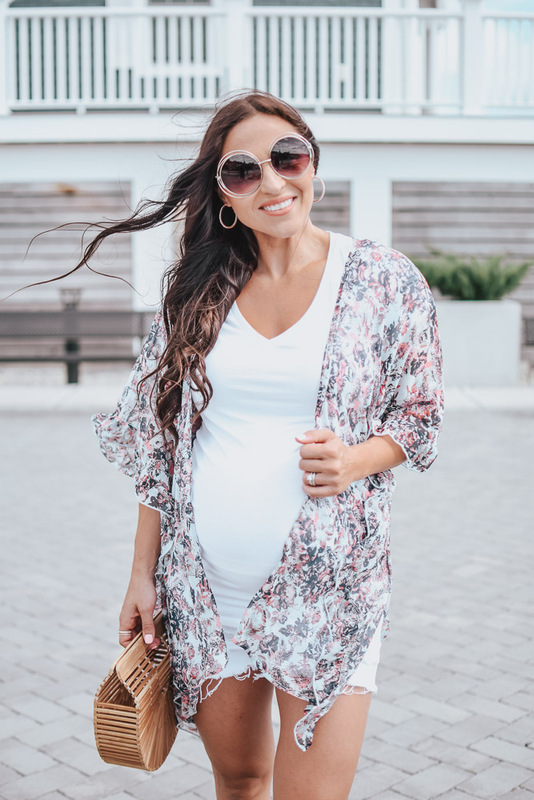 This “Chic & Fun Maternity Outfit Ideas With Macy’s” post has been sponsored by Macy’s. As always, all opinions are my own. I can’t believe I’m nearing the end of this pregnancy! Almost 40 full weeks with our new sweet babe in my belly and it’s really flown by. 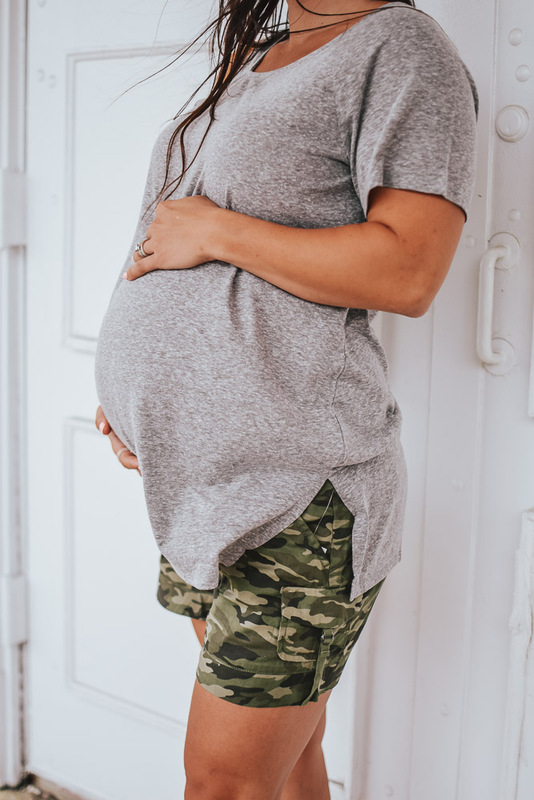 I’ve been having sooooo much fun dressing the bump this time around and sharing my maternity outfit ideas with everyone! Depending on what we’re doing my style changes daily. Sometimes I’m in shorts and a tee and other times it’s a dress and heels. 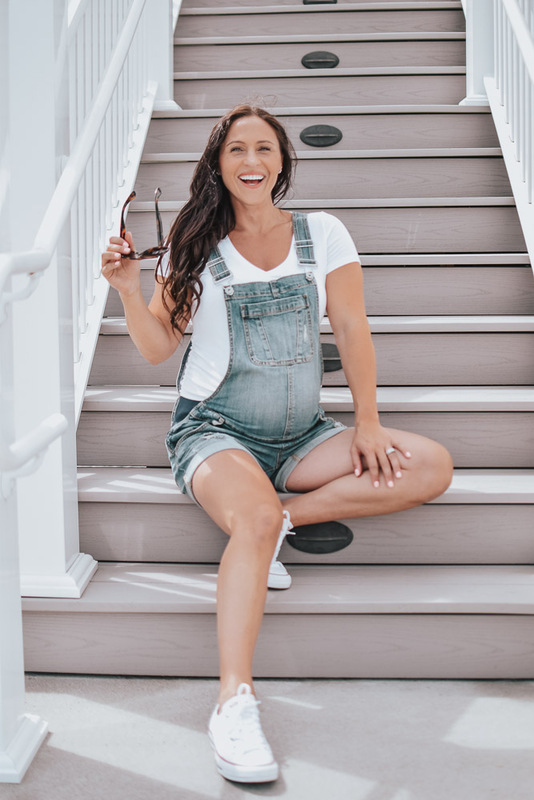 Just because you’re pregnant doesn’t mean you can’t still have fun with fashion! 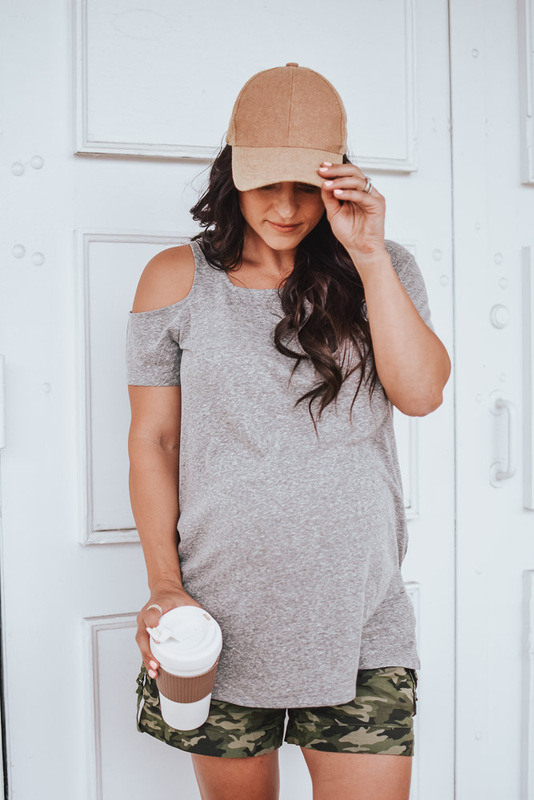 So today I’m sharing some maternity outfit ideas from Motherhood Maternity and a Pea In The Pod at Macy’s to take you from a weekend of soccer games with the kids to date nights and parties with your significant other. While I love a good dress and heels I’m also a sucker for a fitted dress with a more casual vibe. Since we’re usually with the kids all weekend shuffling between birthday parties, running errands and the park I usually opt for something a little more practical. 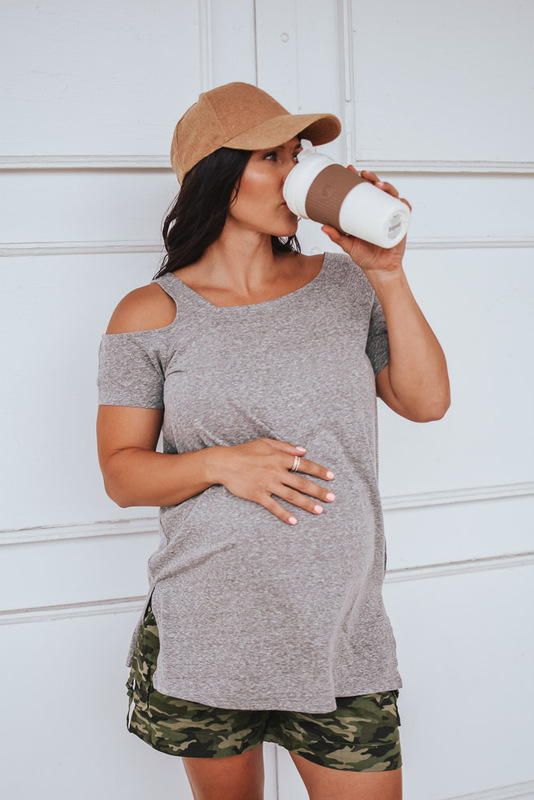 I absolutely LOVE a good bodycon dress and this Motherhood Maternity dress fits the bill for not only comfort but also fit and practicality. Plus, it can easily be dressed up or down depending on the shoes and accessories you pair it with. I’m a sucker for a good kimono/cardigan/cover-up type of top. I love that they can be paired with a variety of other pieces to make several different outfits depends how you style them. I wear a lot of white in the summer and adding in this fun mixed print top gave the perfect pop to my outfit. Although this “A Pea In The Pod” dress is a bit more upscale it’s still super comfortable because of the thick straps (I love being able to wear a regular bra!) and loose fit. The length was also perfect for me (I’m 5’4″ and it fits right to my mid-thigh). The elastic around the waist isn’t too tight and the under-bust ruffle is the cutest detail! 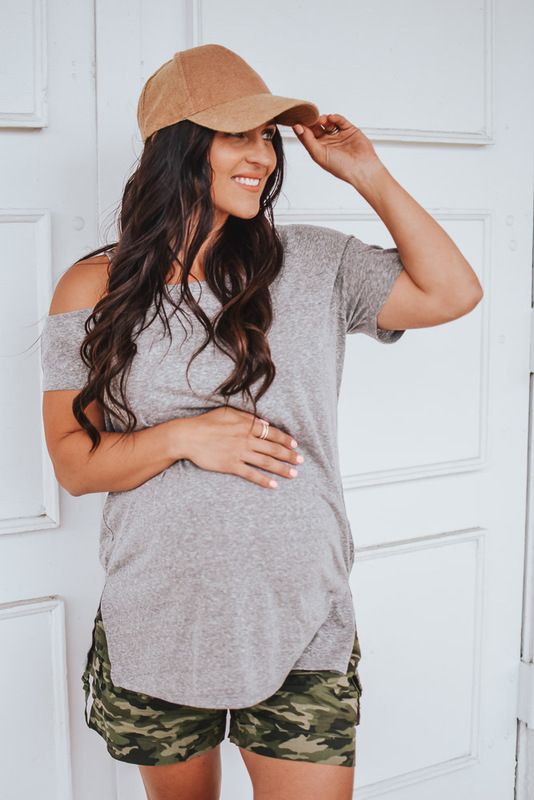 A Pea In The Pod has some great fashion-forward apparel for moms-to-be! When I tell you I’ve been dying for a pair of overalls all summer I mean I’ve realllllllly been dying for a pair!! I kept seeing all these adorable photos of pregnant women wearing them and I HAD to have them!!! 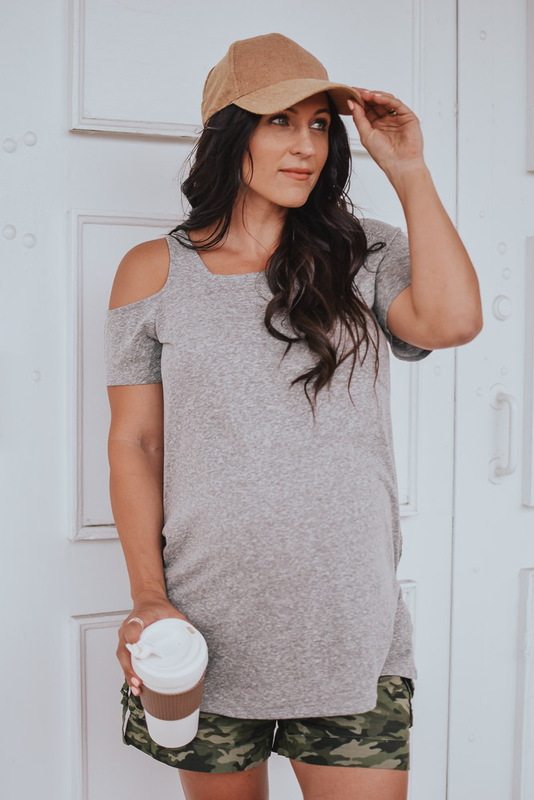 I have a long torso and often have trouble with pieces like this (rompers, too) but this Motherhood Maternity pair is PERFECT!!!! There’s a stretchy band on the sides so the denim isn’t too tight around the bump and the legs aren’t too baggy! I love that their clothes are so fun and playful because entering motherhood (for the third time for me!) is the most exciting time EVER! 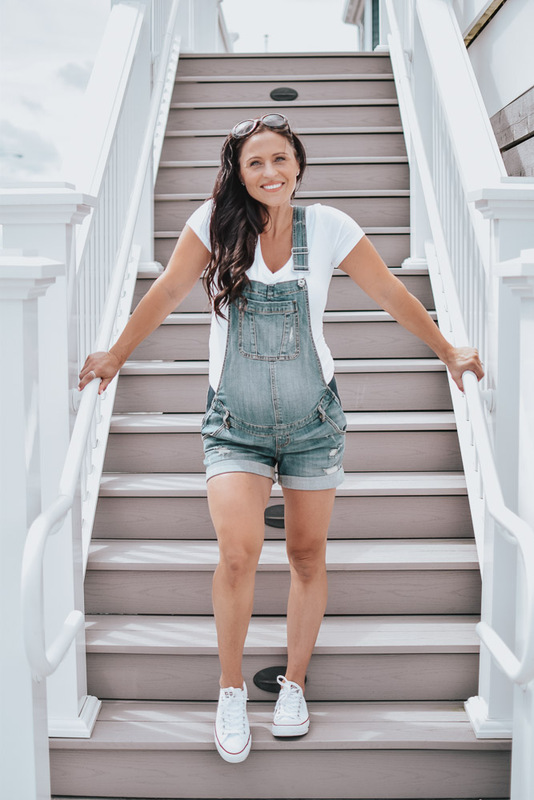 I mean, does anything make you feel more like a kid again then a good pair of overalls?! A staple in my summer wardrobe is always a white tank, whether pregnant or not. This tiered one is lightweight and has a tie under the bust so you can make it as loose or fitted as you want. It’s also long enough to cover a belly band from your shorts or pants and the material is light and breathable. A fun floral blouse can easily take your outfit from day to night. 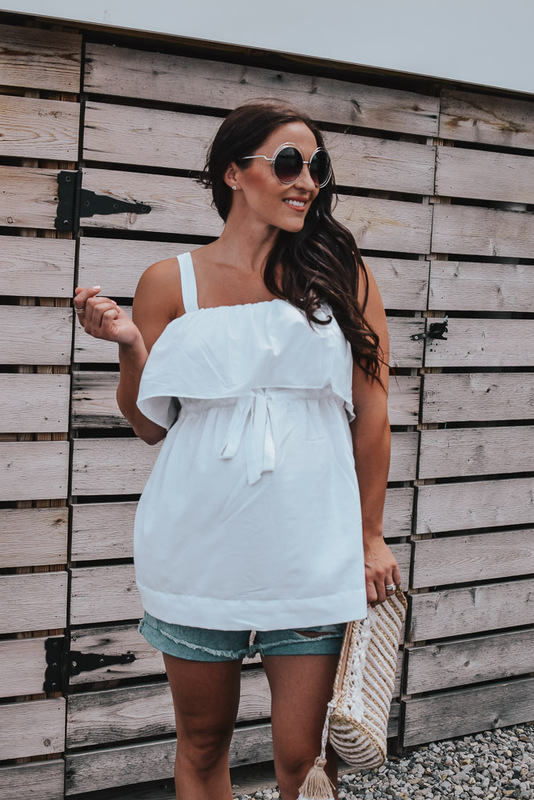 These kind of tops are my favorite because you can wear them with flats, wedges, heels, shorts, jeans, you name it – to make virtually any outfit. This top also has a cinched waist and the spit neckline is the perfect added touch. I paired mine with white shorts for a fun summer day! 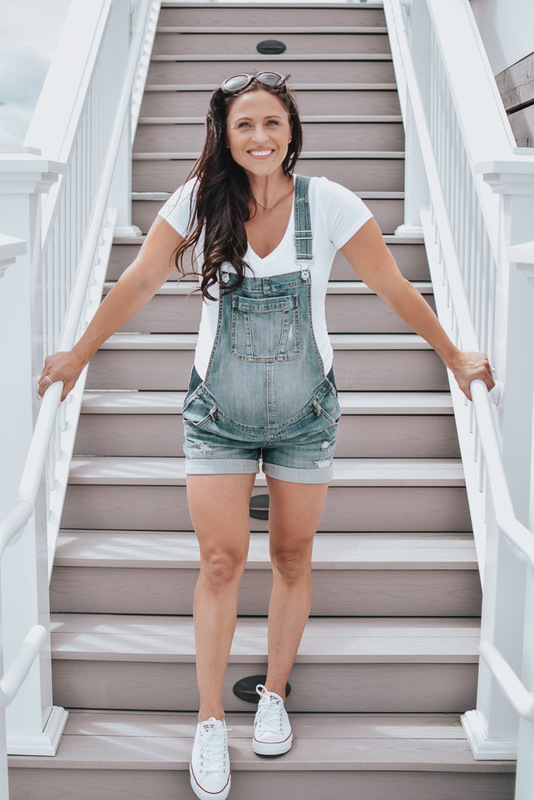 Do you have any maternity outfit ideas for expecting mamas? I’d love to see them! 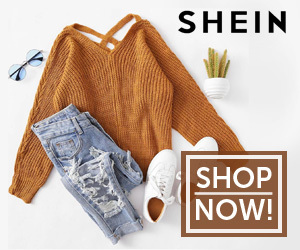 Looking for more Fashion/Shopping posts? Check here. To view the whole line of Motherhood Maternity apparel available at Macy’s click here. To view the whole line of A Pea In The Pod apparel available at Macy’s click here. Share this “Chic & Fun Maternity Outfit Ideas With Macy’s” post on pinterest via the image below! i’m convinced that you look good in ANYTHING you wear! Keep on rocking that bump, mama! It totally looks good on you! oh my goodness you are really too sweet. Thank you so much! You are looking pretty fantastic yourself pretty lady! Wow!! This post has so many outfit ideas! I loved the polka dot dress and the overalls best! Too cute mama! Thank you! Dressing for pregnancy was definitely a lot of fun this time around. The styles have changed so much since having our first!!! You look absolutely darling!!! Cutest pregnant lady EVER! omgosh you look amazing stop that!!! Thank you so much!!! Thanks Nicole! I really enjoyed dressing for pregnancy this time around! Ok these are all too cute! I definitely wasn’t this stylish pregnant! you look amazing! I’m obsessed with the overalls! Thanks so much!! I’m so glad I finally found a pair that I love! Thanks Rachel!!! I’ve had a lot of fun dressing for pregnancy this time around! You look so stunning in all of these that I wish I had a bump again (and I did not enjoy pregnancy! 😂) Would love to see what you’d recommend for nursing-friendly styles! Thank you so much Valerie!! I will definitely be sharing my favorite nursing friendly styles. Cardigans and button downs are top on my list!! lol!!! 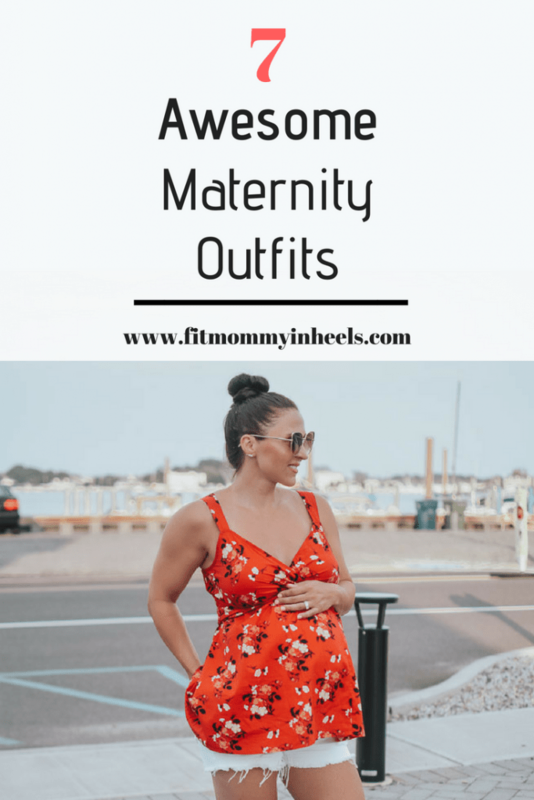 I tried to wear as many things that I could wear post-pregnancy as well! 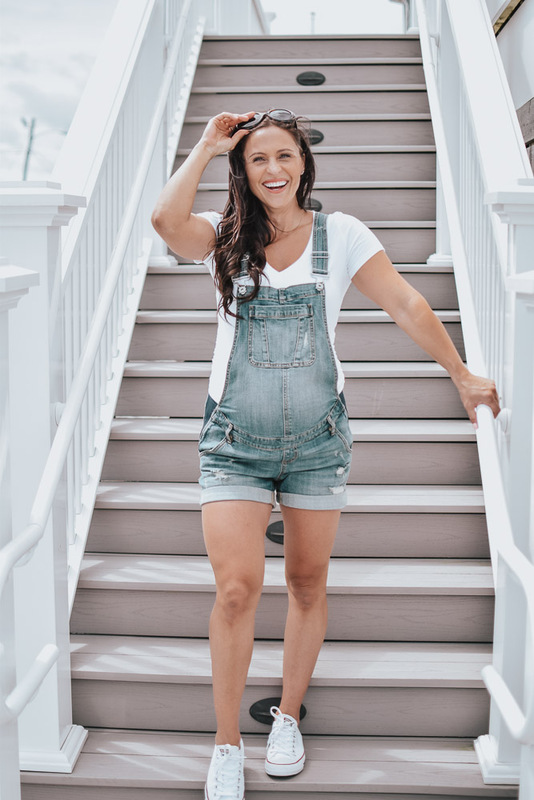 Hi, You look so stunning in all of these.All of your outfits are gorgeous!I’m obsessed with the overalls!I want these all for mine. Thanks so much! 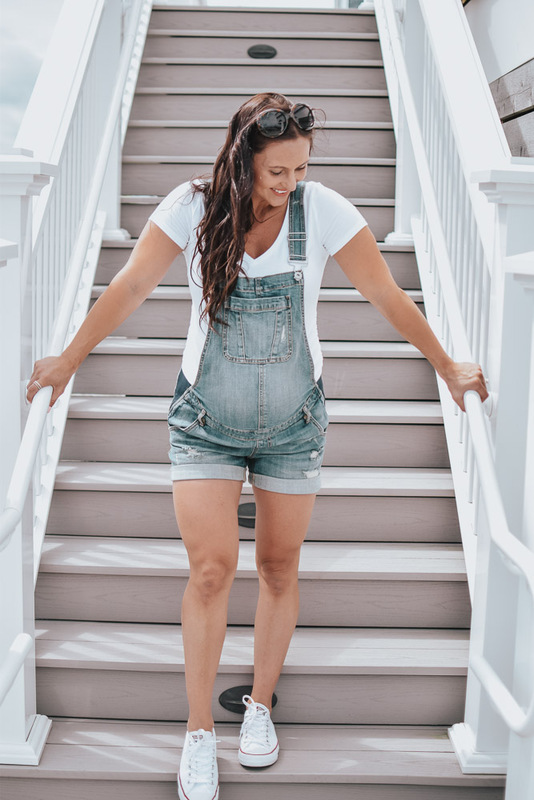 I absolutely LOVE these overalls! I wish had found them sooner!